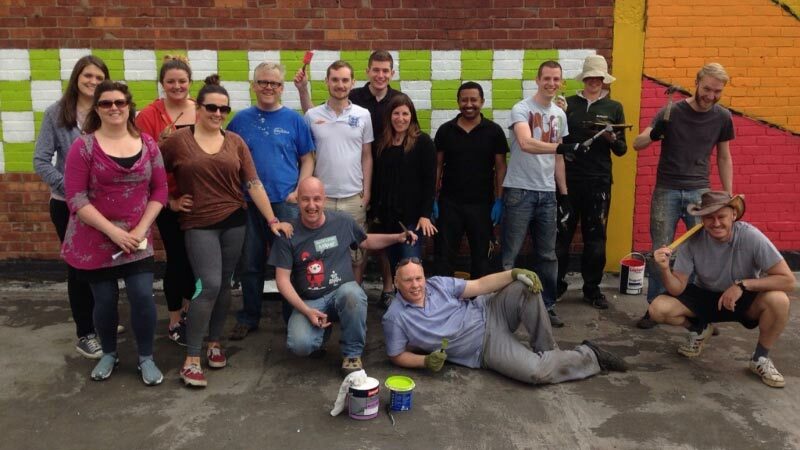 Staff from dock10 have been out and about in Manchester participating in Thrive Trafford’s Volunteers’ Week. Thrive Trafford is a partnership between Pulse Registration and Trafford Housing Trust, which aims to deliver support to third sector organisations and communities. Thirty members of dock10 staff attended two different community projects in the Trafford area over a course of two days. dock10 Chief Operating Officer Andrew Culley adds "supporting the local community is really important to the team at dock10. We take a keen interest in mentoring local students and in creating apprenticeships, alongside many other local initiatives, so the Thrive project seemed a natural extension of this – and a lot of fun too." Mark Cottam, Business Engagement Officer, at Trafford Housing Trust said, "It is our aim with the Thrive initiative to create a thriving third sector. By challenging teams from local business we are providing a platform for them to not only get involved with the local community but to, hopefully, have fun along the way. We were thrilled when dock10 jumped on board with the challenge, the team really threw themselves into it making an incredible difference along the way." The first day was spent at children’s play and learning centre, Cheeky Cherubs, a place for families in the local community. dock10 assisted with the on-going development of the centre by decorating the Cheeky Cherub’s roof terrace, painting the walls and creating bedding planters out of old tractor tires. The second community project involved members of dock10 staff working with the Friends and Family of Victoria School Project in Stretford. The dock10 team were tasked with cutting back hedges and trees and removal of all the rubbish that had accumulated in the area over recent years – no small feat! The team completed the challenge, even making the surprising discovery of a pond amidst the undergrowth and a family of frogs.